CO2 emission and air pollution have adverse impact on environment and population. Increasing CO2 emission will increase intensity of extreme weather events such as increase temperature, increase precipitation, sea level rise, flood and droughts. Air pollution also most significant environmental risks to health. It is estimated become major cause of global death from the environmental problem. It is argued that urban areas have significant risk to impact of CO2 emission and air pollution, considering most of global population will live in urban area by 2050. 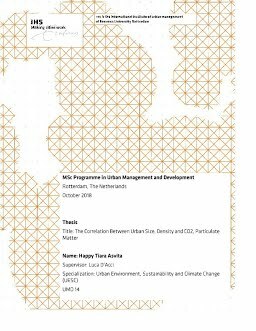 Urban form plays important roles in determining environmental performances in urban areas, since it affects GHG and air pollution concentration through energy consumption, travel behavior and land use. As element of urban form, urban size and density are considered correlate with environmental performance, for instance, CO2 emission and particular matter. However, how this relationship works still questionable. There is a debatable discussion on which size of city, large or small city, has better energy use and air quality performance. Moreover, the notion about high-density area is better than low-density area still arguable. This study analyse the correlation between urban size and density and CO2 emission and Particulate Matter in the urban areas cities in England and Wales using statistical analysis method. Overall, population and density are significant variables in influencing CO2 emission and PM. This finding confirms the importance of population and density as element of urban form in determining environmental performances in urban areas. There is a linear relationship between population, density, CO2 and PM. It means large urban areas is not more efficient than small ones. However, comparing result from LAD and urban area, there is no significant difference result. Both of them showing a linear relationship between population, density amd CO2 emission and PM. In addition, the economic condition of urban area influence concentration of CO2 emission.